1). Place a slice of bread in a container or bag with hardened brown sugar overnight. The brown sugar will be soft in the morning. 2). If brown sugar begins to harden, add an apple wedge to the bag. Seal and let stand until the sugar softens, 1 to 2 days; remove apple. 3). Soften brown sugar in a microwave oven by placing 1 cup of it in a covered dish and heating it at HIGH (100 percent power) for 30 to 60 seconds (depending on the amount of sugar); repeat if necessary. Watch carefully so that it doesn’t start to melt. 4). Put hardened brown sugar on a pie plate and heat in a 250F (120C) oven for about 5 minutes. 5). Use a food processor with a metal blade to break up lumps in brown sugar. A blender also works, though you’ll either have to process the sugar in small batches, or keep stopping the blender to move the top sugar down toward the blades. When using glass, dark colored, or non-stick pans instead of light colored metal pans for baking, reduce the oven temperature by 25°F or 10°C. To sour milk, place 1 tbsp (15 mL) of lemon juice or white vinegar in a measuring cup and fill with enough milk to make 1 cup (250 mL). Stir and allow to rest for 5 minutes. Stir again before using. Bake cakes, muffins, cookies and quick breads on the middle oven rack. Bake yeast breads and pies on the lower rack, unless otherwise specified. Always test baked goods for doneness 5 to 10 minutes before the end of the recommended baking time to allow for oven variances. To prevent apples or bananas from browning, sprinkle with a little lemon or pineapple juice. To extend shelf life of flour, store in sealed containers in the freezer. Flour should be kept in a clean, airtight container and stored in a cool, dry place. To store baked goods in freezer, wrap well in plastic wrap and place in sealed containers or freezer bags. To thaw, remove from freezer and allow to thaw in sealed container/bag. This way the moisture lost during freezing will be re-absorbed upon thawing. What’s the most important rule in baking? Being prepared. Sometimes a key step is somewhere near the end of the recipe. These tips can help make sure there are no surprises. Assemble all ingredients and read the recipe thoroughly before beginning. To prevent bowl from slipping when mixing ingredients, place on a folded damp towel. To measure flour accurately, spoon into dry measuring cup and level off with a knife. Do not pack down. To measure solid fats such as butter, margarine or shortening, use the water displacement method. For example, if a recipe calls for 1/2 cup (125 mL) of butter, fill liquid measuring cup with 1/2 cup (125 mL) of cold water. Add butter until the water level reaches the 1 cup (250 mL) mark. This ensures that you have exactly 1/2 cup (125 mL) of butter. Non-reactive cookware is anything made of a material that does not react chemically to food cooked in it. Stainless steel is the most common material used to make non-reactive cookware. Cookware made of aluminum, cast iron or copper can react with acidic foods such as tomatoes, lemons, or vinegar, giving them a metallic taste; if cooked long enough, it will discolor the food as well. Other foods can be cooked in pans made of these materials without problems. Most better quality aluminum and copper pots and pans are lined with stainless steel to make them nonreactive. You can also purchase aluminum cookware that has been anodized. This process changes the chemical makeup and makes the surface almost (but not completely) non-reactive. When in doubt, however, stick with stainless steel and avoid any adverse reaction entirely. WASHINGTON, Feb. 4, 2003--Although the National Restaurant Association reports that almost one-third of Americans dine out on Valentine's Day, the majority are cooking dinner at home. With the emphasis on decadent desserts for sweethearts, many will prepare such egg-rich dishes as crème brûlée, molten chocolate cakes or chocolate mousse for their Valentines. However, there’s nothing loving about giving someone a foodborne illness. Egg desserts need safe handling and cooking to ensure that Salmonella bacteria don't interfere with a romantic Valentine dinner. Recent data from the Centers for Disease Control and Prevention indicate that illnesses linked to Salmonella enteritidis declined for more than a decade and remained steady since 1999. Additionally, CDC reports that when a food source is identified in a Salmonella outbreak, undercooked and raw shell eggs are the most common culprits. "The overall reduction in illnesses demonstrate that we are on the right track," said Dr. Elsa Murano, USDA under secretary for food safety. "However, extensive food safety education and outreach to consumers continues to play a vital role in further reducing foodborne illnesses." Researchers say that, if present, the Salmonella is usually in the yolk or "yellow" of the egg. However, they can't rule out the possibility of bacteria being in egg whites. "For this reason, we advise consumers against eating raw or undercooked egg yolks and whites, or products containing raw or undercooked eggs," said Bessie Berry, manager of USDA’s Meat and Poultry Hotline. The Hotline educates consumers about egg safety through its toll-free telephone service and food safety publications. "The first rule we teach consumers is that if an egg is cooked to a safe temperature, the Salmonella organisms will be destroyed and will not make a person sick," Berry added. However, desserts such as crème brûlée, molten chocolate cakes, Key lime or chocolate silk pie, tiramisu and chocolate mousse are typically made with raw eggs or egg whites which are not cooked or are undercooked. To ensure that these desserts will be safe if made with fresh shell eggs, the eggs must reach a safe temperature. The eggs can be heated with a liquid ingredient in the recipe. Make sure the mixture doesn’t exceed 160 °F lest the results be "scrambled eggs." 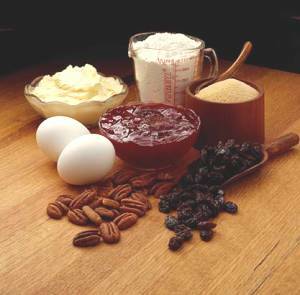 Here are some safe handling tips for safe desserts made with eggs. * Only buy clean, refrigerated eggs with uncracked shells. * Wash hands, utensils, equipment and work areas with hot, soapy water before and after contact with eggs. Don't keep eggs out of the refrigerator more than two hours. * Egg mixtures are safe if they reach 160 °F. Heat gently and use a food thermometer to measure the temperature. * When preparing a recipe that contains raw eggs that won’t be cooked, such as chocolate mousse, truffles and chocolate silk or Key lime pies, make it safe by heating the eggs in a liquid or melted ingredient from the recipe, such as lime juice or chocolate. Warm over low heat, stirring constantly, until the mixture reaches 160 °F. Then combine it with the other ingredients and complete the recipe. * Baked egg-rich desserts such as custard pies, crème brûlée or molten chocolate cakes should reach 160 °F in the center when measured with a food thermometer. * Meringue that tops a pie should be safe if baked at 350 °F for about 15 minutes. * Chiffon pies and fruit whips made with raw, beaten, uncooked egg whites may not be safe. To reduce the risk, substitute pasteurized dried egg whites, whipped cream or a whipped topping. * Desserts will be safe without cooking if made with in-shell pasteurized eggs (available in some parts of the country), egg products or dried egg whites because they are pasteurized at the plant. Although pasteurized, for optimal safety, it is best to start with a cooked base, especially if serving high-risk persons, such as the elderly, young children and individuals with compromised immune systems. It is not possible to pasteurize eggs in the home. * Dry meringue shells and divinity candy are safe. * Avoid icing recipes using uncooked eggs or egg whites. However, "7-minute frosting," made by combining hot sugar syrup with beaten egg whites, is safe. For more information on shell eggs, visit www.fsis.usda.gov/OA/pubs/shelleggs.htm. For more information in English and Spanish, call the USDA Meat and Poultry Hotline at 1-800-535-4555; TTY:1-800-256-7072. The Hotline’s hours are Monday through Friday, from 10 a.m. to 4 p.m., Eastern Time, year-round. An extensive selection of timely food safety messages is also available at the same number 24 hours a day. Information can also be accessed on the FSIS Web site at www.fsis.usda.gov. E-mail inquiries may be directed to MPHotline.fsis@usda.gov. To check the potency of baking powder that may have been sitting in the cupboard for too long, mix 2 teaspoons of the baking powder into a cup of water. If there is an immediate reaction of foaming and fizzing, the baking powder is okay to use. If the reaction is at all delayed or weak, throw it away and buy a fresh can. Be sure to measure your ingredients carefully. Use metal or plastic nested cups for dry ingredients like flour and sugar, and graduated glass or plastic cups with spouts for liquids. If you use a liquid measuring cup for flour, you may get an extra tablespoon or more per cup, which could make cookies hard and dry. To measure flour, lightly spoon it from the canister into the measuring cup and level it with a straight edge of a spatula or knife. Do not tap or shake the cup to level it. When measuring brown sugar, pack it firmly into the dry measuring cup so that it holds its shape when it is removed. For the best flavor and texture, be sure to use the exact type of shortening, butter, margarine or vegetable shortening called for in each recipe. Substituting one type for another could change the taste or the texture of your finished product. Do not use vegetable oil spreads, diet, "lite," soft, whipped or liquid versions of butter or margarine. These products may also give you unsatisfactory results. Put chocolate in a heat-safe zipper-lock plastic bag and immerse in simmering water until the chocolate melts. Snip off just the very tip of one corner of the bag. Holding the bag in one hand, gently squeeze the chocolate out of the bag. Discard the bag when finished. After 3 or 4 minutes of kneading dough, let it rest for a few minutes. The rest relaxes the dough and makes the remaining kneading easier. To avoid ending up with nothing but chocolate shavings when chopping a large block of chocolate: 1. Hold a large knife at a 45-degree angle to one of the corners of the block of chocolate and bear down evenly. Repeat at each of the corners. 2. After you have cut about 1 inch from each of the four corners, you will have a block with eight distinct corners. Treat each of them as you did the original four corners in step one. Soon you will have 16 corners. Continue until the entire block of chocolate has been chopped. At least 15 minutes before whipping the cream, fill the bowl with ice cubes and cold water, place the whisk in the ice water, and put the bowl into the refrigerator to chill. When you whip the cream, simply pour out the ice water, then dry the bowl and whisk quickly. The bowl stays cold and the cream whips beautifully. Dessert isn't quite a necessity, but it endures as one of those little extra things that sprinkle joy into our lives. Dessert is a little present you give to yourself or to the people you love, so why not make that present as delightful as possible? That's why we think every dessert deserves a garnish. A garnish can be anything that adds visual appeal and complimentary colors, flavors, textures, aromas or temperatures to the treat you're serving. At the close of a homey meal, the perfect finish may be as simple as a slice of pie garnished with a dollop of whipped cream, or a bowl of ice cream garnished with hot fudge sauce. On the other hand, when you're ready to serve the final course of a special dinner, you might be ready for some other ideas that'll make your dessert look really spectacular. Professional pastry chefs always keep certain guidelines in mind when they are dreaming up the perfect garnish to go with every dessert. First, every dessert plate is most satisfying when it contains three elements: something creamy, something crunchy and something "meaty" (that is, something you can really sink your teeth into.) For example, the slice of rich chocolate torte you order in a nice restaurant might arrive at the table with a swirl of whipped cream and a candied pecan on top. The torte itself is dense and meaty, the whipped cream is creamy, and the pecan is crunchy. And then, a wedge of cheesecake might come with some slices of mango and strawberry fanned out on the plate, and have a long stick of chocolate protruding from the top. On this plate, the cheesecake is creamy, the fruit is meaty, and the chocolate is crunchy. These three elements work together to create a symphony of sensations in your mouth. These rules may sound far too complicated to bother with when putting together a dessert at home, but it's not as daunting as it may seem. In fact, all of these contrasts can be embodied at once in something as simple as a slice of warm apple pie with a scoop of vanilla ice cream. The soft apples are paired with the crisp crust; the richness of the pastry is tempered by the leanness of the fruit; the warm pie alongside the cold ice cream wakes up the palate; and the sweetness of the ice cream and the glaze on the apples is the perfect foil to the tartness of the apples themselves. If you ponder your favorite desserts, you may just find that most of them already follow these rules of contrast. SAUCES: (cold or warm) chocolate, vanilla custard (a.k.a., crème anglaise), caramel, butterscotch. FRUIT PUREES: raspberry, strawberry, blackberry, mango, kiwi, peach. FRESH FRUIT: (sliced or whole) raspberries, strawberries, blackberries, blueberries, pomegranate seeds, mangoes, kiwi, peaches, carambola (a.k.a., star fruit), pineapple. CITRUS: fresh or candied zest, fresh or candied rounds. EDIBLE FLOWERS: pansies, rose petals, marigolds, tulip petals, orchids, violets, nasturtiums, orange blossoms, snapdragons. HERBS: mint leaves, lavender sprigs. POWDERS: confectioners' sugar, cocoa powder, ground cinnamon, ground nutmeg. WHIPPED CREAM: plain, sweetened, or enhanced with liqueur or flavored extracts. CHOCOLATE: shavings, curls or other chocolate designs. NUTS: whole or chopped, plain or candied. Once you've picked out the dessert you want to serve, choose one or more garnishes from the list, following some of the guidelines of sensation and contrast above. Don't forget to choose colors that look good together, too! Think three-dimensionally. Use the whole plate as your canvas. Sauces, purees and fruit can be arranged all the way out to the edge of the plate. The whole plate can be dusted with a fine flurry of cocoa powder, citrus zest or chopped nuts. Think vertical, too! Use tall curls and ruffles of chocolate or long, thin cookies propped up next to or planted right through the middle of the dessert. Are you ready to have some fun? Here are some more pointers for using these garnishes. Have a ball with purees and sauces by "painting" a plate with them. This is easiest when you put your sauce in a plastic squeeze bottle (available at any store that sells kitchen supplies) but it can also be done with a spoon. Create designs by using two sauces of contrasting colors, such as chocolate sauce and crème anglaise, or raspberry and mango puree. Make a pool of sauce in one color, and then place small polka dots of the other sauce on top of the pool. By dragging the tip of a toothpick through the middle of each polka dot you can create a flock of tiny hearts swimming across the dessert plate. Or, create stars by starting at the middle of each dot and dragging the toothpick outwards several times. You can use this swirling technique to make all kinds of fun patterns and shapes. Another fun and easy design to make is the 'spider web.' Before putting the dessert on the plate, squirt a circle of sauce around the perimeter of the plate. Squirt another circle of a contrasting colored sauce just inside the first one. Repeat a few more times, alternating the colors of sauce. Now drag a toothpick through the rings of sauce, starting at the inside of the plate and moving towards the edge. Do this every inch or so, all around the plate. Neat-o! Now carefully place the dessert in the middle of the decorated plate. Feeling more abstract? Just make some free-form drizzles of sauce over the dessert and the plate. All you need to create delicate chocolate curls is a hunk of chocolate and a vegetable peeler. Zap the chocolate in the microwave for just a few seconds to make it slightly softer, and then drag the peeler firmly down the side of the chocolate block. The bigger the piece of chocolate, the bigger your curls can be. Store them in a cool, dry place until you're ready to serve dessert. Lift and arrange the curls using toothpicks so the heat from your hands won't melt them. Ready for something more elaborate? If you want to try your hand at tempering chocolate, you can make all kinds of fun designs for adorning desserts. Put the tempered chocolate into a pastry bag or a heavy plastic bag with the corner snipped off and draw designs with it onto a sheet of parchment paper. You can make hearts, flowers, butterflies, curlicues, fans, letters - anything at all. If you like, you can even put a picture or a drawing underneath the sheet of parchment paper and trace the picture in chocolate! Once the chocolate has hardened, you are free to lift the designs off the parchment and place them on top of your dessert, either flat on the plate, planted in the dessert to stand up straight, or at any angle you choose. Regular dessert plates are, of course, perfectly acceptable for serving dessert. But they certainly aren't the only answer. If you're feeling bold, use dinner plates instead, and make big, sweeping designs with your sauces and other garnishes. Creamy desserts like ice cream or pudding are fun to eat from wine glasses or martini glasses. If you're serving something layered like trifle or tiramisu, you could use these same glasses to make delightful, individual-sized portions. Get even more whimsical by serving fruit sorbets inside of hollowed-out fruit. Oranges, lemons and peaches work particularly well. Just cut off a slice from the top and scoop them out with a melon baller, taking care to leave enough flesh that the container won't be too flimsy. Freeze the containers to keep them firm until you're ready to use them. Also try hollowing out small, halved melons, pineapples and coconuts. Make chocolate bowls by painting the inside of foil baking cups or small balloons with a thick layer of tempered chocolate (to release bowl, peel away baking cup or pop balloon). You can also make bowls out of tuile cookies simply by draping them over a glass or a bowl while they are still warm and pliable. These ideas are just the beginning of your dessert adventures. Whether you're just looking to give a rustic dessert a little lift or elevate a decadent dessert to the status of the divine, go the extra mile at serving time with a few well-chosen adornments. Every dessert is a gift, a work of art, a flight of fancy for the palate and the spirit, so remember, every dessert deserves a garnish! The term "toasted flour" refers to dry roux. Roux is used in many Cajun recipes for thickening and is done by cooking white flour in butter until it takes on a nutty aroma and has a brown color. Dry roux or "toasted flour" is done in a frying pan not the cooking pot as in traditional roux, and no fat is used at all. You are literally dry frying the flour to give it that brown color and flavor. What happens in roux is the starch molecule is cracked and that allows for the liquid of the recipe to be accessible to the starch creating a smoother texture in the soup or gumbo. "Toasted flour" can also refer to flour made from various grains or nuts that has been toasted. For example, we carry toasted almond and hazelnut flours. The toasting accentuates the flavor, and gives them a golden brown color. Our toasted nut flours are used to add flavor and texture to many items, including cookies, quick breads, and pie crusts. What are the Differences between a Buckle - A Betty - A Grunt - A Pandowdy - A Slump - A Cobbler - A Crisp and A Clafouti? Similar to the Crisp, the topping is crumbled over the fruit filling in the pan. A Crumble is baked. In this baked dessert, the fruit filling is covered with a crunchy topping which is crumbled over the top. A Grunt is a stewed or baked fruit dish. The biscuit dough is rolled and put on top of the fruit. The name of Grunt may have come from the noise people made while eating it. Grunts are also known as Slumps. You'll find both spellings in this baked dish. The dough is on top of the fruit and although it is rolled out, it ends up being crumbly. This dessert is the same as the Grunt.